Gmail is one large beast. Like the rabbit warren, the further in you venture, the more there is to see. Recently I decided to move all my email dealings to Gmail, prompted in no small part due to the meltdown of my laptop. I can say that so far it has been a resounding success. Gmail makes a lot of tasks simpler, and adds something new (well a few things new) to the mix. You can see the format of the page when you log in from the image above. Simple. Basically, you’ve got your inbox. Any new emails are there (apart specifically filtered ones, which I’ll go into later). Clicking on an email will bring it to the screen. You can read it (boring), OR .. you can do stuff to it. Waaay cooler. 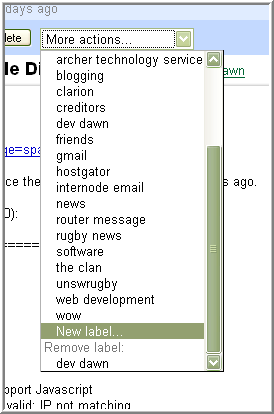 The coolest functionality Gmail provides, in this write’s opinion, is the Labelling. 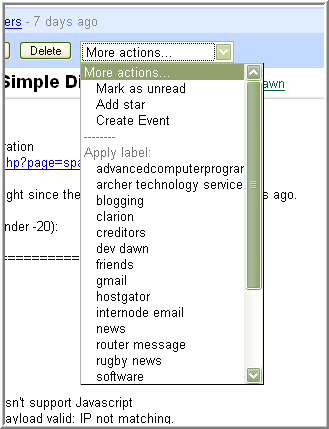 An email can be labelled, Labels can be part of the filtering process, you can very easily sort by Label. See, at first, Gmail confused me. There was just an Inbox and then some other folders .. but I couldn’t create my usual convoluted folder structure like I’ve always done in dear old Outlook (and Express). This is what sort of lamed me off a few months ago when I first looked at Gmail. The light was slow, but it did dawn on me. Who cares?? What’s the point of a folder? To allow me quick access to a specific set of emails. Most usually emails from a particular person or group. They take the place of folders, sprinting away down the track leaving the old tortoise (hmmmm, really, perhaps I should have thought this one out a little more) to cludge away with his archaic practices. Well no, not really. Folders work for the desktop. They make sense, because that’s the way windows has done them. And by windows, I mean Microsoft. In most people’s experience, although folders were around before then, no doubt. Just different. 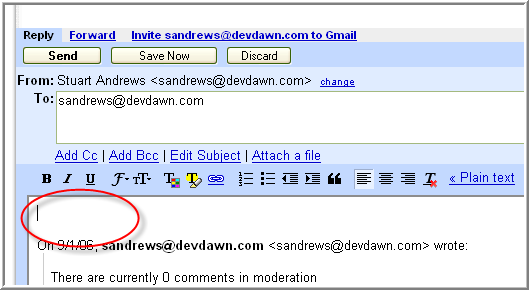 As the red circle above (my picture emote of choice, although I’m considering changing to something more appropriate in moving people’s eyes to a certain part of the image) indicates, this email has the Label’s inbox and dev dawn. inbox is transient, obviously. It only hangs around until you move it out of the Inbox. But everything else is gas. In this particular case, I’d like to do something more to the email, apart from reading it. As you can see, there’s a few things. Unread. Star. Create Event. Right now, I want to add a new Label. Let’s call it "mushu rules" (— For more Mushu information, please visit This Site and others — End Advert Broadcast from 31st century). 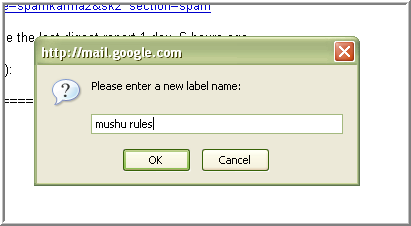 As you can see, the Email now has the "mushu rules" Label applied to it. Some nifty (and important) information can easily be found by clicking on the "Show Options" link (which becomes "Hide Options" immediately following). 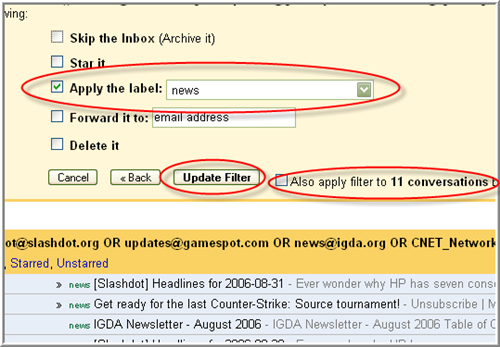 You get the normal email info, which I find useful when creating a filter (later). 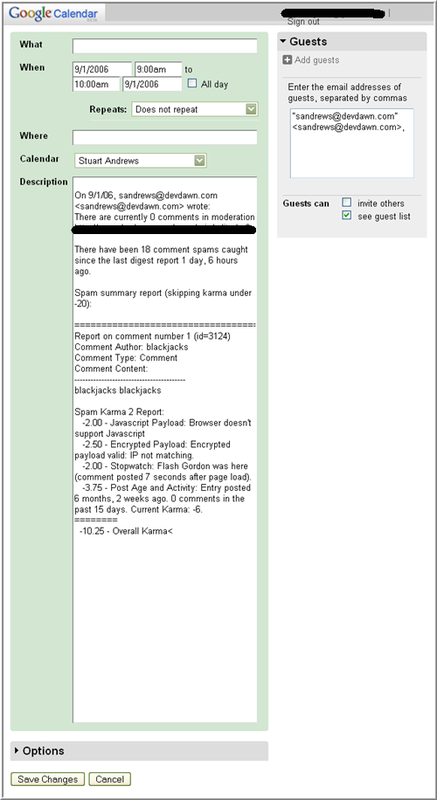 Next, I’d like to reply to this email (It’s a spam report, which obviously would be pretty useless to reply to). There’s a text box at the bottom of the email. You can click on it straight away to start typing your reply. But wait! Some magic happens. A little bit of the Ajax mojo gets to work, and what was once a simple text box becomes a fully-fledged email editing window, complete with the usual text modifying functionality, CC/BCC’s, and a big To: window (plus more). Once finished you can send it, save it, or discard it. You can do the latter two at any stage really. One cool little bit of funk is the spelling. Choose your language and away you go. Of course, my spelilgn isi ewsomae, so i don’t need such a thing :). Next up (and this is obviously not restricted to replies, but any email) you can add Event Information. Events are the bread and butter of the Google Calendar . To add a basic Event, you only need to click on the link. But if you’d like to get more freaky with your event-y .. click on "more event options >>". A new window pops up. Loading .. loading .. WHOAH! Interesting. It seems we’ve discovered some kind of wierd object known as a bug. But, it’s okay. This is a beta after all. So you know, beta’s have that kind of stuff in them. But come a Full Release, and BAM .. no bugs. Well, at least, I’ve heard that’s how it works. A bit more adventuring and you can get around this little issue. At the top of your page, click on the "Calendar" link. It’ll open up Google Calendar in a new window. If you now go back and try "more event options >>" it will bring up a real non-bug information window. Cools! Edit your event info, Save Changes (whoops, I didn’t check out the Options on that page .. maybe next time), and away you go. Next off, we head back to the Inbox. Notice that some of the emails already have Labels attached to them? How is this deep magic accomplished, I hear you ask in wonderment? At the top of the page, you’ll see the option to "Create a filter". Click on this. 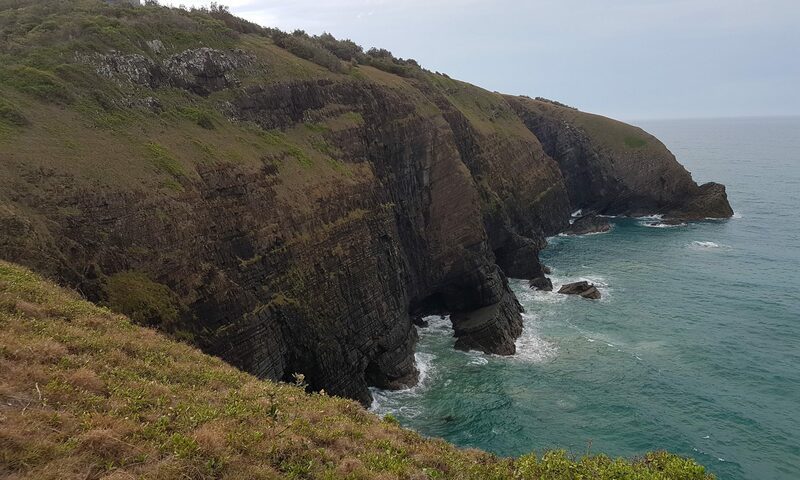 The next two images split the initial Filter page into two. Basically, Filter’s are Rules. You are telling the Gmail engine what you want done with an email (single, set, whatever). This is cool. At this time, my filters are singular in effect. They take emails of a certain kind (From Email Address, and a couple of Subject lines) and attach a specific Label to them. But you can do a whole lot more. I haven’t yet grasped the power of the Star functionality, but I’m sure it’ll come. However, at this time, we’re gonna take a look at the existing filters. I want to examine the last one, which is my Filter that applies the "news" Label. Let’s click on the "edit" link to the right of the Filter. Setting a single Email Address is easy, but I discovered when you want to add more than one Email Address to a Filter, you have to get creative by checking out the help. Or googling. Which you could argue is one and the same thing. Append the new Email Address to the end of the From: entry box, conjucting (not sure if this is the right word) with an OR in capital letters. It has to be OR, and it has to be in capital letters. Place parentheses ( .. ) around the entire string entry. In this instance, we are editing, and thus the Label is there already. Optionally, you can choose to apply the Filter retroactively. This won’t happen by default, although it would be cool to have a Global Option somewhere to turn this on. But anyway, until Google listen to my wisdom, click on the checkbox that says "Also apply filter to x conversations below". Hit the "Update Filter" button. 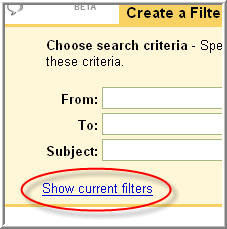 The Filter will run, if you’ve check the checkbox, the emails will retroactively have the Label added to them (those that fit the Filter), and you’ll head back to the Filters Browse. We’re almost done. Heading back to the Inbox, I’ve got a couple more things to bang on about. 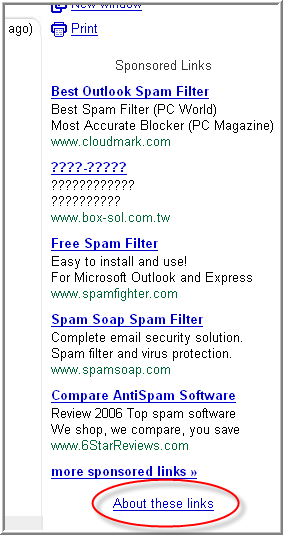 Some subtle advertising exists on the Inbox page. It’s cool, because it’s not intrusive .. BUT .. your eyes do notice it. Especially when it changes magically to account for what Emails you have in your Inbox. Before your brain worries about the big conspiracy theories, it thinks .. Cools! The advertising is much more obtuse in an Email page. That is, when you are inside the Email, reading it. 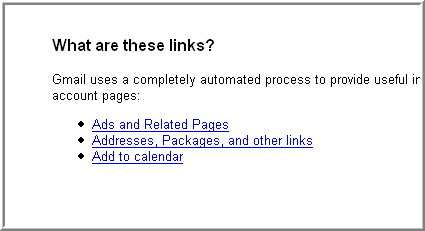 Feeling adventurous, I decided to click on the link "About these links". On first seeing that, I laughed. Who wants to know about these links? Well .. I kind of did. Pretty boring really. I thought it might have given me some info on the actual links, stats, something cool. Instead, it was just what you’d expect. 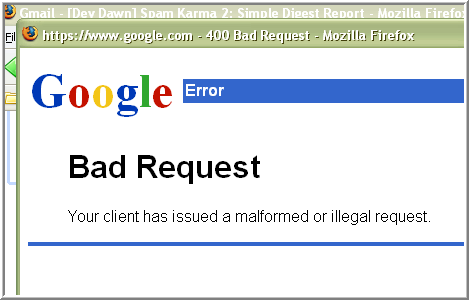 Help on Gmail. How it works. So this has been a Partially Digested look at Gmail. As said in the intro, it’s a large monster. I’ve only touched the surface today. But thankyou for reading, listening (I wish), watching (again, wish) .. it’s been a blast.